Much of Africa is dry and desolate country. Our first encounter with the desert was a 2000 kilometer ride through the Sahara a little more than a year ago. This always impresses people. They imagine us heaving our bikes over sand dunes, camping alongside turban-clad nomads and drinking sweet camel's milk to quench our thirst. 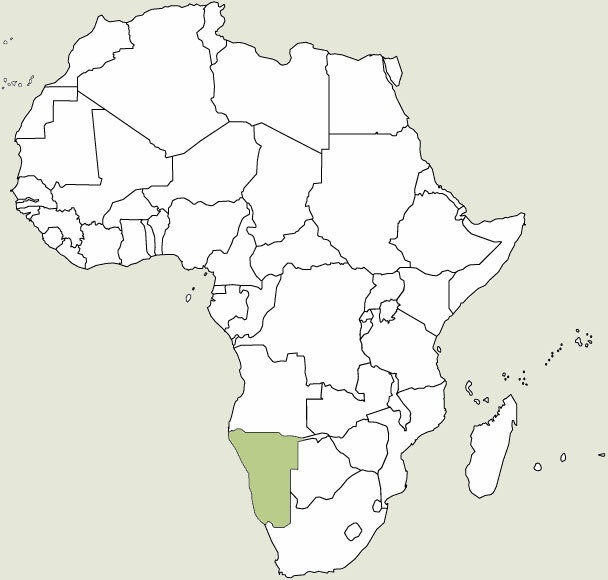 Western knowledge of African geography being what it is, few people will ooh and ahhh when you tell them you've made it through Namibia. They should. 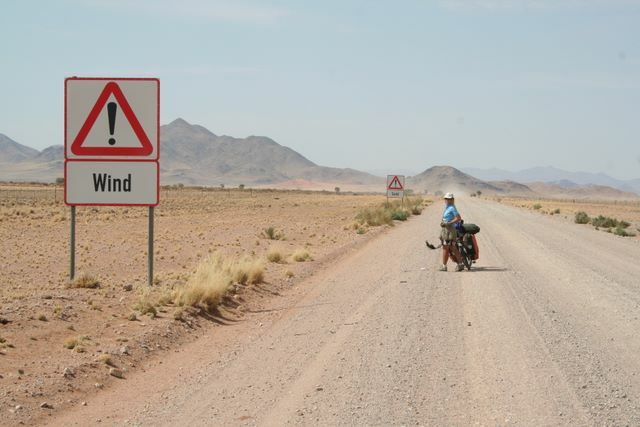 In fact, there is an easy way through Namibia. It's called the B1. A nice paved road which slopes gently downwards towards South Africa. A sort of dream come true for two cyclists who've endured 16 months on some of the roughest roads in the world. So it was with some surprise that we found ourselves heading out of Windhoek on a gravel road. Perhaps some higher being was trying to send us a message when the lycra-clad mountain biker ahead of us turned back at the point where the tarmac came abruptly to an end. 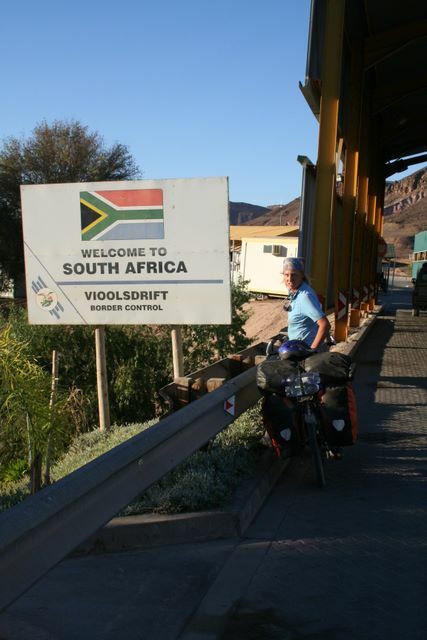 But at that point, we were still in high spirits anticipating this one last little adventure through the desert before the orderliness and easiness of South Africa. We pressed on through the sand. 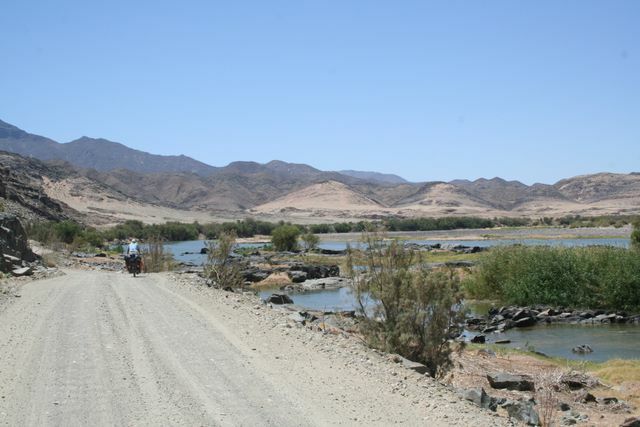 Those who had recommended this scenic jaunt through the Namib desert had assured us there would be no sand. We were suspicious. We'd been on plenty of tracks in arid Africa and there was always sand. 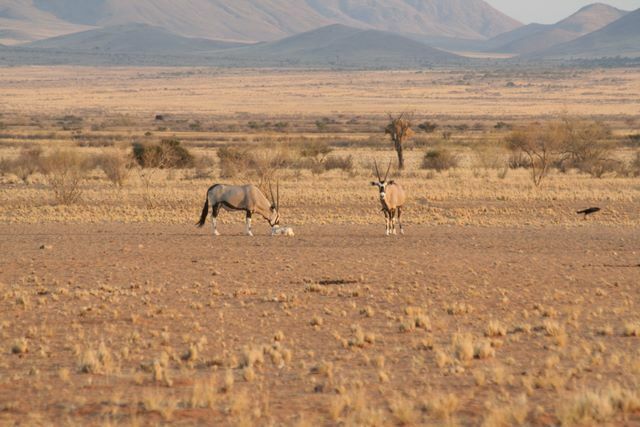 The Namib turned out to be no exception. In all fairness, the road really was quite well-maintained in most parts. In a 4WD, 500 meters of soft sand poses no problem. 10 kilometers of corrugations pass in a flash. Crosswinds go unnoticed. A 100 kilometer stretch of uninhabited terrain is a romantic wide-open space. For a cyclist, 500 meters of sand can mean 50 minutes of additional agony under a scorching sun. 10 kilometers of corrugations rattle your bones for an hour. Crosswinds can bring you crashing to the ground and uninhabited terrain means a parched throat as you ration your diminishing supply of water. Never ask a motorist for advice on which route to take if you're cycling. That was our mistake. 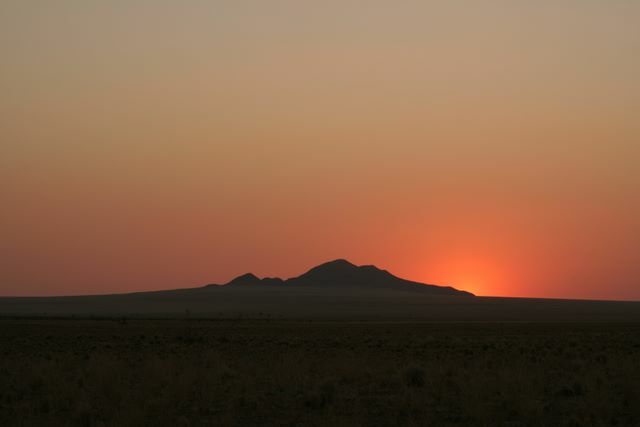 We'd listened to these motorized tourists as they described the beauty of the apricot-colored Sossusvlei dunes at sunrise. They'd entranced us with talk of endless mountain vistas and the eerie silence of the lonely plateau. And they'd absolutely scorned our plans to follow that smooth, flat highway. It'll bore you to death, they'd all agreed. So what's 900 kilometers on gravel roads through a desert we told ourselves? But our hearts weren't really in it. 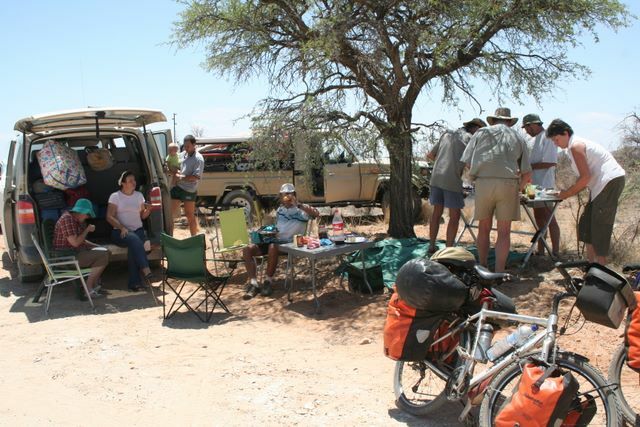 As we stopped for a quick break not more than 20 kilometers out of Windhoek, a couple of tourists pulled up in a 4WD and Eric's first remark was 'maybe they'll give us a lift if we ask nicely'. Amaya was appalled. 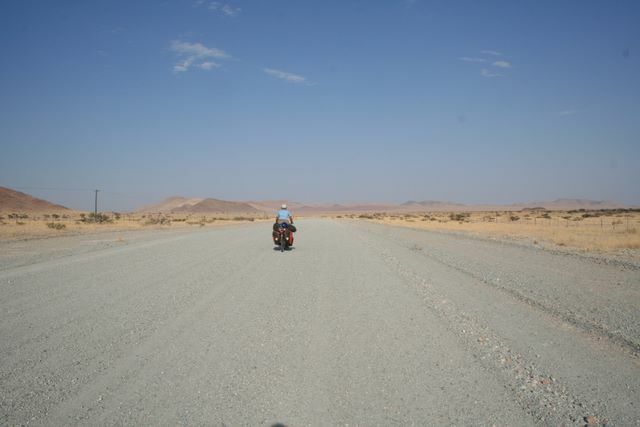 'Almost 30,000 kilometers through really rough places like the Congo and you want to wimp out in Namibia?' Not that the idea wasn't appealing to her. There was nothing she would have liked better than to load those 50 kilos onto the bed of a truck and ride in comfort. But it would be far too humiliating. Knowing we would reach the tarmac road, civilization and therefore supermarkets the following day, we broke into our food reserves and gobbled down all the cookies meant for the next three days. We went to sleep on full stomachs and awoke the following morning smiling knowing tarmac awaited us. Setting off down the road we stopped to take just one last picture on the track to commemorate the experience. And wasn't it a beautiful place, with the mountains in the distance bathed in a soft orange light. And this road really isn't all that bad. Oh and I'd hate to miss those dunes. They're really not that far. And before you knew it we had turned around again and we weren't heading back towards the tarmac but deeper into the desert. I wish we could say we never regretted our decision. It was now day two of our desert drama and we were meant to climb the Spreethoogte Pass. The traffic thinned out and the farms were spaced wider and wider apart until we began to understand that 'alone on the planet' feeling. No farms meant no water and we were running low. We had set off that morning with 10 liters of water between the two of us. Unfortunately, we'd lost 3 liters when the bottles we had strapped on the back bounced off without us realizing it. To be on the safe side, we decided to flag down the next vehicle that passed and ask for water. We started waving frantically at the next cloud of dust that approached and, with a screech of the brakes, the 4WD came to a halt. After getting over his initial shock of seeing two cyclists in the desert, the driver hopped out of his Land Rover, popped open the back and presented us each with a two liter bottle of ice-cold water. Then he glanced at his watch and suggested we join him for lunch. Cold water and food all in one go...this is something like having your cake and eating it too for a cyclist. Just too good to be true. These people had tables and chairs. They weren't crouching in the sand like we usually did. They offered us cold cokes, 3 kinds of cheese, sausages (for Eric, the ex-vegetarian)cookies and crackers and so much food! Much better than warm water and cold baked beans from a tin. Hospitality in Southern Africa is something very special. In Europe we'd been turned down by farmers when we'd simply asked to pitch our tent on their land. They eyed us suspiciously and directed us to the nearest country inn. In Namibia we'd been offered accomodation by a complete stranger who saw us in front of the supermarket. Tina gave us the guest room, introduced us to her family, cooked us a delicious dinner and then insisted we stay another day to rest up. When we knocked on a farmer's door in Seeis, Patrick answered, and again we were given a room when all we had requested was a patch of grass. I'm sure nobody in this part of the world would turn us down for camping. As we set off to tackle the final 50 kilometers up to the pass, our stomachs and water bottles were full and our spirits high. Reaching the small settlement of Nauchas we violated a cardinal rule by passing a source of water without filling up our bottles. We didn't want to waste time fetching water because it was getting late in the day and we wanted to make it up to the pass where supposedly there was a campsite. Amaya had her doubts. What fool would put a campsite on a windy mountain pass? Only 12 kilometers to go but the road was getting steeper and steeper. As we neared the top, there were gradients of up to 25%--no wonder only 4WD vehicles were allowed to attempt the pass. Our legs were burning and our strength almost gone as we finally made it up the last steep incline, but the incredible view that opened up before us (almost) made us forget the pain. No campsite was in view and poor Eric was hit with a barrage of I told you so's and ' I knew we should have-- filled up our water bottles when we had the chance/ camped at the settlement 12 kilometers back/followed the paved road/stayed in Europe/never quit our jobs to cycle through Africa etc. Amaya was so riled up by the thought of spending the night in the bush with just a liter of water for drinking, cooking and bathing that the reproaches would have continued till morning had not a small sign reading 'campsite' come into view just as we began to lose sight of the setting sun behind the mountains. Saved again. It was time to change the brake pads when we made it to the bottom of the pass early the next morning. Temperatures were well into the 90's (35 celsius) by mid-morning and we were roasting by the time we arrived for a pit stop in aptly named Solitaire, some 40 kilometers from where we'd camped. The town consisted of a few houses, and a filling station , shop, café and motel all rolled into one. It was nevertheless an obligatory stop because there was simply nothing else out there but sand and the odd sheep farm. Moose makes a mean apple strudel and after 4 helpings we were ready to face the desert once again. 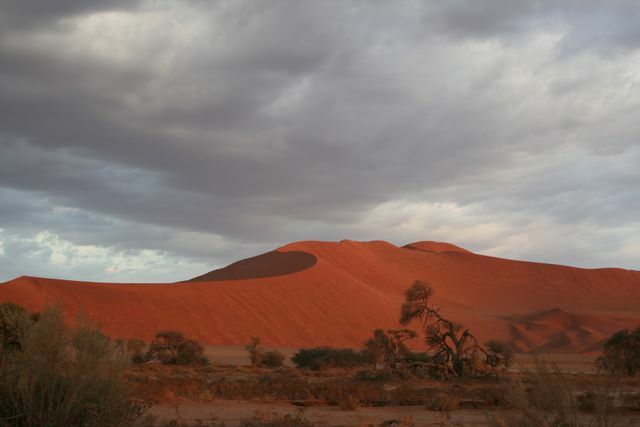 We were headed toward Sesriem, the jumping off spot for visits to the famous dunes of Sossusvlei, and every half hour or so we'd be passed by cheerful-looking tourists in air-conditioned 4WDs. The passengers would hang out the windows, give us a toothy grin and snap our photo. We hated them. The traffic dropped off at about 4PM and around 7PM we finally made it to the campsite, having spent more than 9 hours in the saddle being scorched by the sun, tossed around by the wind and humiliated by fellow tourists who treated us like exotic zoo animals. We were more than fed up. As is often the case, when you finally reach your breaking point something wonderful happens that makes you forget all your trials and tribulations. 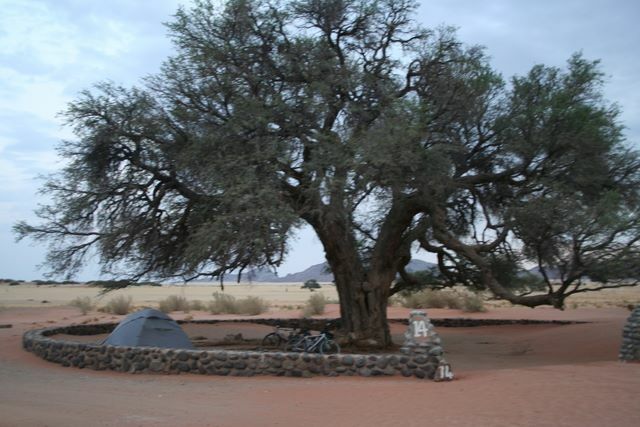 Sossusvlei is the most popular spot in Namibia and as such you must reserve well in advance for a campsite. Of course we hadn't done this, so the kindly gentleman in charge motioned to some distant spot where we might pitch our tent. We were probably quite a sight as we struggled to push our overloaded bikes on the sandy track in search of the 'overflow' camping. It was now dark and we'd obviously taken a wrong turn and our bikes weren't going anywhere in the deep sand. And then came our savior, Barry, beckoning to us to join him at his campsite. Barry is South African and the South Africans must be the most hospitable people on the continent (although the Moroccans come close). He helped us settle in and then invited us to a braai. Within an hour all thoughts of the day's horrors had been dispelled and all this thanks to Barry's 'intervention'. Left to our own devices we would have surely been squabbling, grumbling and arguing about who gets to finish off the last of the peanut butter. The following day was a 'day off' to visit the dunes. 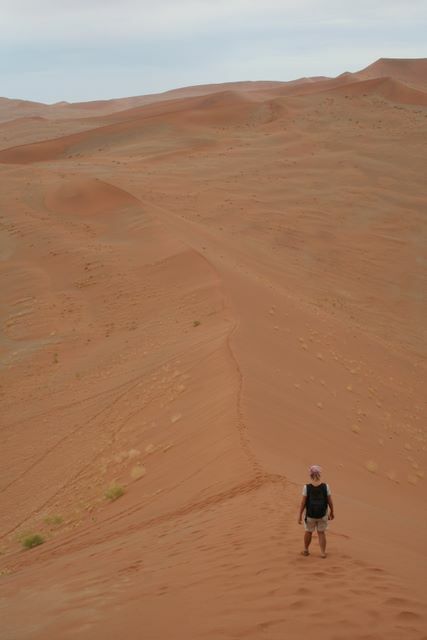 Still, we were up at 5AM in order to hitch a ride to the dunes, 60 kilometers away, for sunrise. Sossusvlei is spectacular and the visit was only marred by the arrival of a boisterous group of German pensioners on a package tour. Fortunately for us, most of them obviously enjoyed their Beer and Bratwurst a little too much and, after much huffing and puffing and a half-hearted attempt at climbing the dunes, they turned back, leaving us in relative peace. By mid-morning we were back at the campsite which Barry had kindly bequeathed us, having himself cut his trip short in order to make it back to Cape Town to catch the World Cup Rugby finals. The previous day's long ride had exhausted us, but the tent had heated up like an oven and we were drenched in sweat almost as soon as we lay down to rest. Sleep was impossible. In a brief bout of industriousness, Amaya attacked the laundry, hung it to dry and then burst into tears the next time she looked up and saw that the line had snapped and the clothes were being buried in the sand. The physical exhaustion meant we weren't faring very well emotionally either and the slightest trouble would set us off. We knew it was time for an extended break and were anxious to make it to South Africa. During the night, the cool breeze turned into a gale and sand streamed into the tent through all the minute holes that have multiplied over the months. By morning the force of the winds had barely diminished and packing up camp was a nightmare. Cycling was no better, as we were caught in a crosswind and it took most of our strength just to keep the bikes upright. Reaching a crossroads, Eric suggested we bring an end to all the suffering and wait there until a passing truck picked us up. Great idea in theory, but chances of this happening were slim. We were nearing a private nature reserve and the only people on the road were tourists in their rental vehicles. We pedaled onwards, but the strong gusts hampered our progress and morale was at its lowest ebb. All the heat and sun were draining and we again found ourselves dangerously low on water. We'd already drunk most of the 10 liters we'd started off with and there had been no sign of human existence for several hours. We flagged down the next vehicle we saw, a Land Rover (rented) full of tourists. What a shock we had when, after requesting some water, the women in the passenger seat turned to her husband, her voice filled with annoyance, and remarked in German, 'aber wir brauchen das Wasser für 3 Tage,' which translates into 'but we need that water for 3 days.' Absolutely no pity for two thirsty cyclists stranded in the desert. Her husband, a much more sympathetic type, gave us each a small bottle of water. Being rather desperate we accepted with a smile, all the while fuming at what we saw as petty selfishness. They were motorized and only 60 kilometers from a settlement where there was piped and potable water! Before they parted they informed us that they'd seen no farms or any type of dwellings for a very long time and we certainly wouldn't reach water or shelter before nightfall. And then they were off, leaving us alone to contemplate our dilemma. 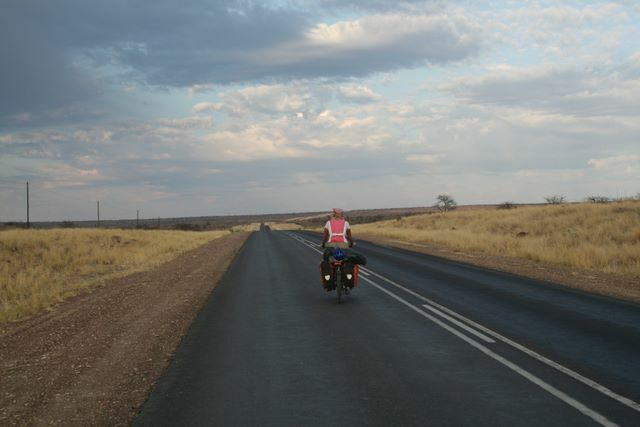 Most people who cycle through Africa are avid bush campers. That we had made it almost the entire length of the continent without having spent a single night alone in the wilds of Africa is an oddity. If only we had some water. A few more tears were shed and Amaya thought seriously about what she could have done to bring on this bout of bad karma. She finally concluded that it was a result of her own refusal to share her water with a young Zimbabwean when she had been in Vic Falls. Fearful that if she let him have a sip he would run away with the precious Nalgene bottle that was so coveted by all the young men, she had turned him down when he asked for water. What goes around, comes around as they say. Imagine our surprise and delight when, in the distance, we started to make out what could only be a dwelling of some sort. As we drew nearer we saw that it was a large house set a few kilometers back from the road. A sign at the turnoff read 'Namib Rand Private Reserve Warden's Residence'. What luck! We wouldn't die of thirst, be killed by a band of marauding bandits or eaten by a pack of hungry mountain zebras after all. Nils, the burly warden, welcomed us with a warm handshake and acted as though he had been expecting us. There was no need to explain our predicament. Hospitality came naturally to him and he lead us to the fully-furnished guest bungalow and told us to make ourselves right at home. Whew--things turned out alright in the end yet again. 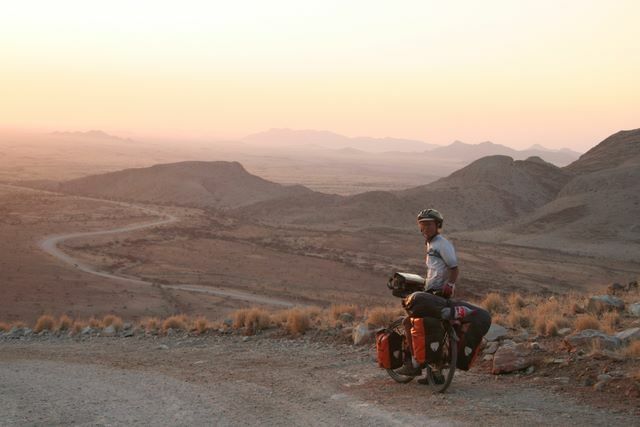 Four more uneventful days hammering on through the desert and we made it to the Orange River and our first view of South Africa on the far side. The slender patch of vegetation near the river banks was a veritable oasis after seeing so much sand. We were so overjoyed to be out of the desert that we didn't even mind all the hills. 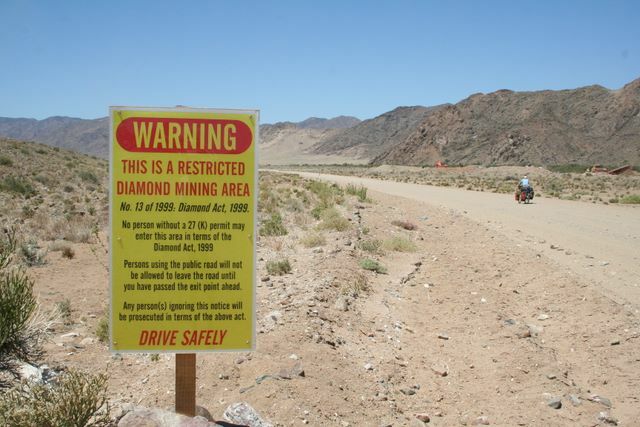 At one point we entered a 'Restricted Diamond Mining' area where a sign warned that leaving the main road was forbidden. Spotting a water tap not far from the road, we took our chances and ventured over to see if we might be able to fill our bottles. Almost immediately an AK-47 toting guard was at our side. We took his grunt as permission to fill the bottles, but as we were dismounting the bikes, two Rambo lookalikes pulled up in a pick-up and gave us the evil eye. They were clearly highly disturbed by our presence and might have been trigger-happy psychopaths for all we knew. We did our best to look like the innocent tourists that we are and hurried on our way. Some 10 kilometers before the border post we hit tarmac again and solemnly promised each other to stick to paved roads in the future. 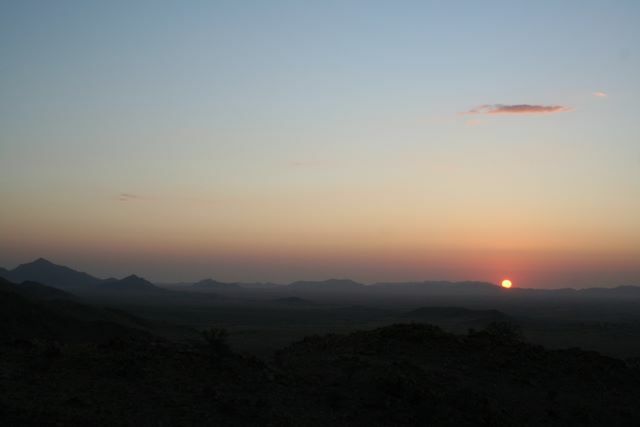 Namibia was quite an adventure: intense highs as we swooped down a mountain pass or gazed at the ever-changing dunes in the distance and horrific lows, as encounters with the elements sapped our energy and will to continue. Perhaps we're being a tad melodramatic in recounting this past month's events. Put it down to the accumulated fatigue of almost a year and a half on the road. At the moment, we're being spoiled as the guests of Ken and Angela, two intrepid adventurers who have criss-crossed Africa by land rover, bicycle and motorbike. They tell us their home is technically within the Cape Town municipality, so maybe we'll pile the bikes in the back of the baakie for the final 45 kilometers into Cape Town proper. It is tempting. Stay tuned, another update coming to you soon!